The city of Cancun chopped down millennia-old mangroves to build glittering resorts along the coast. The resorts bring in billions, but the cost is high: not only do barren shores erode more quickly, but fisheries and coral reefs suffer when mangroves disappear Two side events at climate talks in Cancun tomorrow examine the economic value of mangrove forests. This article has been adapted from a story that ran in the leadup to the Sixteenth Katoomba Meeting, which took place on February 9 and 10, 2009, in Palo Alto, California, and focused on the role that payments for ecosystem services (PES) can play in promoting sustainable use of ocean resources. Leading up to the meeting, Ecosystem Marketplace commissioned this series of articles to shed light on these issues. Part One, Uncharted Waters, provides an introduction to the ocean’s ecosystem services and the evolving schemes for identifying their value and bringing this value into our modern economy. Part Two, The “New” Ecotourism, examines the role that environmental finance can play in ensuring the viability of living ecosystems by persuading mainstream tourism providers to pay for the natural beauty these living ecosystems provide. Part Three, Will Catch Shares Help Reel in Overfishing? examines the role that catch shares can play in promoting efficient management of fish stocks. Part Four, What can Oceans Gain from Freshwater WQT?, examines existing schemes that provide an economic incentive for keeping lakes and streams clean, and asks whether these schemes can be expanded to include the oceans. Part Five, Mangrove Forests as Carbon Sinks, examines the potential for using carbon finance to save and restore mangrove forests around the world. 30 November 2010 | CANCUN | It’s hard to imagine a more valuable ecosystem than a mangrove forest. These rugged coastal woods protect the shoreline from both sudden storms and gradual erosion; they provide shelter for young fish, breeding grounds for shrimp, and wood for local villagers – all of which are the fruits of clearly delineable ecosystem services, each which has a clear line to who benefits the most. This should, in theory, make it easy to entice those who benefit into paying for the ecosystem services that mangroves generate. Tourism operators and fishers, for example, could both pay mangrove guardians for the upkeep of coral reefs; fishers could pay for the nurturing of their prey; and anyone along the shore could pay to keep the sea at bay and prevent their houses from falling into the sea. There’s just one catch: in most developing countries, the people who benefit the most from mangroves don’t have the money to make payments for ecosystem services. This leaves the carbon market as the most promising way to fund the rescue and restoration of mangrove forests, with payments from fishers who export and tourists who visit trailing far behind. Virtually ignored by carbon markets until recently, “blue carbon” became a hot topic with the 2009 publication of two reports: “Blue Carbon: the Role of Healthy Oceans in Binding Carbon” and “The Management of Natural Coastal Carbon Sinks”. Both explored the value of ecosystem services that mangroves provide, but they ultimately concluded that more study was needed before such services could form the basis of payments. Mangroves are especially suited for carbon capture because they pile most of their carbon on the ocean floor, while terrestrial forests keep most of it in trees and branches. Both mangroves and terrestrial forests put down roots and drop leaves, of course, but when mangroves do it, the ground beneath them rises – as does the level of the sea, as it has for thousands of years, says McGill University professor Gail Chmura, who runs the Global Environmental and Climate Change Centre. The same applies to salt marshes, which move so far inland that when Chmura digs into the mud marshes of New Brunswick, Canada, she often finds the remains of forests below them. As the levels of both the ocean surface and the mangroves soil rise, so too does the amount of carbon sequestered in the earth – and it can stay there for millennia. That same rise, however, has a downside: namely, it often makes things inhospitable for the species of mangrove that created it, says McGill researcher Paola Fajardo. She’s studying the carbon storage accumulated in the soils of mangroves in Mexico, with an eye towards developing carbon offsets. It doesn’t take much of a change in elevation for one species to die out and another to take its place – both in nature and in restoration projects, she says. But if there’s no room for the mangroves to move inland, the mangrove forest can die. As a result, mangroves tend to be segregated along species lines within a single forest, as different types of trees seek different elevations within that forest. And it doesn’t stop there. Different species also have different taste and tolerance for salt. Seawater, by comparison, usually has about 35 units – so some species thrive on the coast, some a bit inland, and others in areas where seawater gets trapped and salinity increases. 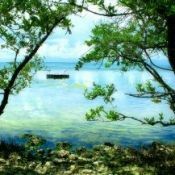 Global warming, therefore, poses a double-whammy of rising sea levels and altered salinity levels for these valuable resources – threatening not only mangroves as they exist today, but making it difficult to project with certainty the amount of carbon that any local action can sequester over time. Ultimately, that means developing sophisticated coastal plans that take into account the entire ecosystem in which mangroves lie. Many of the current plans for adapting to global warming, for example, involve the erection of dikes to hold back water, while networks of dams have been erected to keep cities from going dry. Unfortunately, says Fajardo, many of those dikes and dams are altering the flow of runoff from land to sea – depriving the buffering mangroves of the fresh water and sediments they need for the ecosystem to be sustained. Even if done right in the short term, dikes provide a barrier against which mangroves can’t accrete inland – meaning as they rise but can’t migrate inland, they will have to either adapt, perish, or be altered artificially. Mangroves are a type of wetland, and one ecosystem service that wetlands provide is filtration: they extract unwanted elements from water passing into them, so that water passing out of them is relatively pure and clean. Chief among these unwanted elements are agricultural nutrients – fertilizers that farmers use to help their plants grow, but which feed unwanted plants like algae when dumped into the sea. Those nutrients, however, have a tremendous impact on the amount of carbon that mangroves capture and store – and salt has an equally tremendous impact on the net amount of greenhouse gasses that wetlands capture and emit. Increasing the flow of agricultural runoff from coastal lands can spur the growth of mangroves in height, but it can also diminish the amount of carbon they store in the soil. On the other hand, she says, more salt in the water usually means more sulphur as well – which usually translates into less methane released into the air and a better impact on the atmosphere, according to research conducted on the Chesapeake Bay back in 1987. In fact, because methane is 23-times more powerful as a greenhouse gas than carbon dioxide, many freshwater swamps and bogs may be doing more greenhouse damage than they’re preventing – while saltwater mangroves are, she believes, most certainly doing more good than harm. Early research into the amount of carbon sequestered in mangrove soil yielded wildly varying results – but Chmura says that may reflect the fact that most research looks at the percentage of carbon in patch of soil rather than the amount of soil per square meter of territory, which is what the carbon market looks at. The reason: just as Arnold Schwarzenegger and Michael Moore may weigh the same but be composed differently, soil can be dense or lightweight. Dense soil might have a low percentage of carbon and a high percentage of sediment, while lightweight soil – like the kind in a peat bog – might have a high percentage of carbon and low percentage of sediment. They both, however, sequester the same amount of carbon per meter per year. Both the Clean Development Mechanism and the Voluntary Carbon Standard have established methodologies for measuring, monitoring, and paying for the carbon captured in mangrove forests, but critics say the tools available so far don’t adequately address the most important aspect of mangrove carbon: the soil. Several efforts are underway to correct this, and one of the most promising is the Danone Fund for Nature, which is an initiative being spearheaded by the International Union for Conservation of Nature (IUCN), the Ramsar Convention on Wetlands and Danone (aka Dannon in the US). The fund has developed guidance and standards for sequestering carbon through wetland restoration projects which also deliver community benefits. A first plot project has been undertaken by the Senegalese NGO O©anium to test the efficacy of using carbon finance to fund mangrove restoration in Senegal. Danone hopes the project will sequester enough carbon to offset some of the greenhouse gas emissions of its Evian mineral water operations, and it enlisted 80,000 villagers from 350 villages to plant 36 million trees last year. The pilot phase is focusing on planting mangroves, while a subsequent phase might look at the broader hydrological stresses of the mangrove systems in Senegal.